Rinat Arslanov is an entrepreneur with over 10 years in business, a venture capitalist and, over all, a blockchain enthusiast. He founded Revain, a Russian startup that is advancing a next-generation feedback platform, mostly based on the blockchain technology, which doesn’t allow to change or delete reviews and rewards its authors for creating them. The company has recently launched its crowdunfing capaign to continue to develop the project. We asked him some questions about the company, the platform and its technology, the crowd sale and future plans. FinSMEs: Hi Rinat, can you tell a bit more about you? What’s your background? Rinat: It all started in the town of Sharypovo in the Krasnoyarsk Region where I, Rinat Arslanov was born on August 29, 1982. My first entrepreneurial experience happened when I was 10 years old. I worked as a salesclerk at a small store in a village on my summer vacation. I helped my parents build a house with the money I earned. I had a goal to make enough money to buy a Nintendo, which was extremely popular back then. This was the first goal I achieved. At that age, I realized that communication with the client played the most important role. Trust, pleasant constructive communication, quality product, and feedback are the main principles of success. I graduated from a village school in 1999, and enrolled at the Yaroslavl Higher Military School of Air Defense of the Russian Federation. I served for 10 years, 5 years of which were on the Kola Peninsula in the Subarctic. The fact is that the salary of an officer in 2009 – 24,500 rubles. As a family of three, my wife, son and myself, we lived paycheck to paycheck, constantly in debt. After that, I decided to change my life, to change myself. I started changing my habits, my living principles. My wife and I would read books every day: Bodo Schaefer, Robert Kiyosaki, Napoleon Hill, Vladimir Dovgan. We would read, listen, visit various trainings, play Cash flow. I was able to look at this world differently. I saw new opportunities. The most interesting happened in 2009, I quit the army, and started my first business. It was a small section of consumer electronics (3.5 square meters). I myself could barely fit there. In 2010, I opened the second section, this time it was 30 square meters. In 2012, I decided to sell these two sections and move to Moscow. In 2013, I started a business which employed 150 people. We dealt with apartment renovation services. In 2015, more than 1 million square meters of work was completed. FinSMEs: How did you come up with the idea of creating Revain? Which problem do you want to solve? Rinat: At the end of 2016, I underwent training at Business Youth. The course is called “Million for One Hundred,” hosted by — Petr Osipov and Mikhail Dashkiev. Awesome guys, great team. Very efficient training. This question hit me like a thunderbolt! Without thinking twice, I launched a call center within one and half month and flew with my family to Ko Samui in Thailand for two months. This was the most beautiful time! I would spend the entire day with my family. The sea, the beach, the sun – it was amazing. Having escaped from the hustle and bustle, disconnecting the brain, I decided to think about directions of my further development. This time is the moment of getting to next level. To be honest, I did not know about it yet. Again, I believe that there are no accidents in life. Before arriving in Ko Samui, I visited the Open Innovation – 2017 exhibition in Skolkovo Institute of Science and Technology, I often heard the “blockchain” word in different sections. It always sounded very emotionally, vividly, brightly, enthusiastically and always repeated that technology would change the world. I wrote it down in a notebook and went back to the operating management. On Ko Samui , I opened the notebook and saw this very mysterious word for me. What is it? Why this technology will change the world? I had many questions. I again plunged into a new, interesting topic entirely! I would read a lot. When I got back home from the isle, I started visiting various conferences, I met some very clever and interesting people. One day I thought, I always tried to achieve the best possible results for my business, for me a very important thing was written customer feedback. Real, emotionally detailed, truthful, and realistic opinion! Grateful customers would bring me 2-5 new orders; I saw and understood how important trust was. After all, a person shares their impressions of work and talks about them in their inner circle. My customers share their emotions in social networks, talk about my product wherever there is an opportunity. Feedback takes the form of value, a form of trust, a form of an invisible asset that generates new customers for your business. FinSMEs: How does Revain work? Rinat: Revain is the first review platform that implements the blockchain technology in order to ensure feedback legitimacy and as a backbone for the economic model which ensures that all feedback is genuine and legitimate. Fragments of reviews are saved in the blockchain, which guarantees that those comments can’t be edited at a later date. Our project is different from most other blockchain projects since two tokens are required for the system to function properly. By using both tokens it is possible to create a stable coin which can be used as an internal mechanism vital to the functioning of the platform. Our goal is to create an easy-to-use service that would enable companies to receive constructive feedback about their goods or services. Meanwhile, users will be able to share their experience and learn from the experience of others. FinSMEs: How do the tokens works? Rinat: Token R will be used to gather funds during the crowdsale, as well as a currency for exchange trading later on. The RVN token will be used exclusively inside the Revain system. This approach allows for a stable exchange rate. The internal token of the system, RVN, helps motivate participants to take their reviews and all related actions seriously. R tokens are created in a limited supply during the crowdfunding phase, while RVN ensures the functioning of the whole system. We understand, that as more and more people use our platform, the demand for the R token will become higher than the supply (since the number of R tokens is limited), and it’s price on exchanges will start to grow. Since the reason for the creation of two tokens is ensuring the stability of the RVN exchange rate, the main requirement for the conversion is the possibility of leveling volatility. The currency rate of RVN should not be affected by the market and the rate of the R token in particular. – Penalizing users for noncompliance with the Rules of the platform. Rinat: I am the only one founder of the company. Sergey Potekhin is a CTO and Tech Lead. 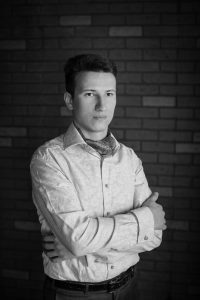 Sergey has been doing programming for about 5 years, one year – blockchain development. His favorite programming language – Python. He works under xubuntu. He heard about bitcoin in 2013 for the first time. He tried to do some mining on a home computer. We have got a great team working on the project which consists of front and back end developers, designer, community managers, copywriter, and digital marketing group. FinSMEs: You are running a crowdsale right now. Results? How do you plan to use the funds? The goal of our crowdsale is to secure funds for R&D and cover platform-related costs. The accumulated funds will be divided as follows. FinSMEs: Which are Revain’s near and medium term future plans? Rinat: Our short and medium term plans are outlined in the Road Map. The project is initially set up for two years. During that time, we plan to open development office in Moscow, release Revain crowdsale test version, integrate with stock exchanges after crowdsale, bring partners and users to the platform. Segments that we are to cover include crowdsale, gaming, E- commerce, FMCG and booking. We are planning to create open-source desk-top app (Windows, Mac, Linux) and mobile apps (IOS, Android, Windows Phone). As a medium-term plan, we are to build successful profitable multinational company with offices in other countries.